Nation Ford Chemical (NFC) announces the commissioning of a new 16,500-sq-ft warehouse. 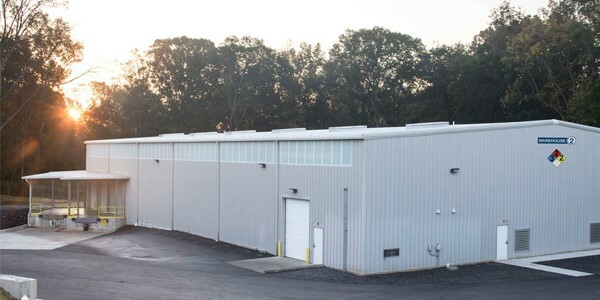 Nation Ford Chemical (NFC) announces the commissioning of a new 16,500-sq-ft warehouse that will nearly double the footprint of indoor storage space at its campus in Fort Mill, SC. The new warehouse will also include additional loading docks, allowing NFC to ship and receive materials in a more efficient manner, according to NFC President Jay Dickson. "As in every project we undertake, NFC looks to be cost-effective and efficient," Dickson said. "We took advantage of double-deep pallet racks to utilize the space as effectively as possible. This design allows us to fit more materials in the warehouse, along with providing additional organization." The new warehouse will also allow NFC the ability to better segregate materials based on product line and other characteristics. The warehouse will provide customers with added value through the ability to store additional product on-site before shipment. It will also allow NFC to more effectively utilize the FIFO system for raw material inventory. "The new warehouse further reiterates NFC's ongoing commitment to making investments in the infrastructure of the campus," Dickson said. NFC appreciates the off-site warehousing service of Total Distribution Inc., located in Charlotte, NC, for handling the extra storage requirements over these past few years. On the upcoming horizon, additional investments in infrastructure include an expanded personnel and training facility, possible additional bulk liquid storage and improved rail handling capabilities.